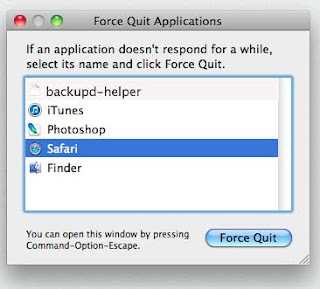 When I opened up my Macbook this morning, I noticed in the process window (brought up by Apple Menu>Force Quit or by pressing command-option-esc) there was the word "backupd-helper"
I've seen in other forums that if this "process" is running … it could prevent shutdown or restart of your Mac. A pop up that says the application backupd-helper canceled logout may appear. Time Machine is a backup utility developed by Apple. It is included with Mac OS X and was introduced with MacOS 10.5 "Leopard"
The utility has continued to be a part of the operating system throughout 10.6 (Snow Leopard), 10.7 (Lion), 10.8 (Mountain Lion). The message is from Time Machine - the application is "looking" for your connected backup, either by USB, Firewire, Thuderbolt, SD Card, Network, Wireless, or other source. The app may do this "search" for up to 30 seconds.